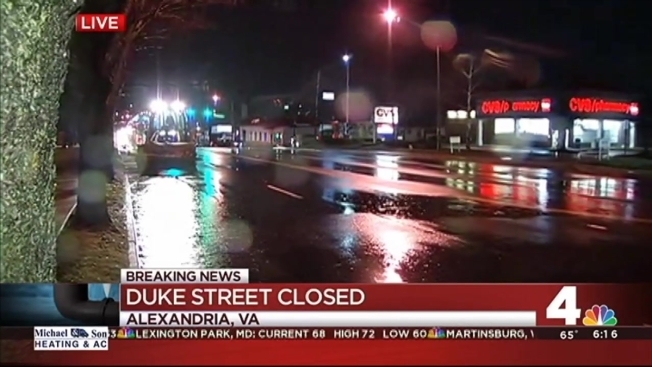 Some lanes of Duke Street in Alexandria were shut down Thursday between S. Quaker Lane and Sweeley Street due to a water main break. Authorities said shortly around 12:45 p.m. that the break has been repaired and were expecting to fully reopen Duke Street within an hour. Duke Street was completely shut down early Thursday morning; crews later opened one lane in each direction. The break happened in the 3100 block of Duke Street, near the Alexandria Commons shopping center. Virginia American Water was called to the scene for repairs. Drivers were strongly encouraged to avoid the area, but crews created a detour via Colvin Street. Drivers headed west should turn left onto Roth Street; those headed east should turn right onto S. Quaker Lane. Authorities say the break affected several businesses on the south side of Duke Street.